How to play the revitalised Secret Hunter in the Rise of Shadows expansion. 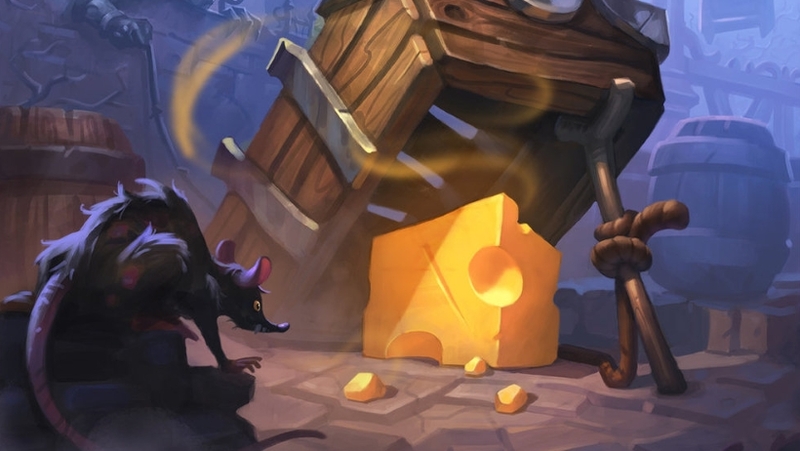 Our Secret Hunter deck list guide features the best Rise of Shadows deck list for Hearthstone (April 2019). Our Secret Hunter guide also contains Mulligan advice, card combos and strategy tips. Secret Hunter is a Hearthstone deck archetype that stormed its way into the metagame following the release of the Karazhan Adventure way back when, and has varied in popularity ever since. While Hunters have always relied heavily on their collection of Secrets to climb the ladder consistently, this particular deck is absolutely stuffed to the brim with these sorts of spells. In our Secret Hunter guide we've got the most powerful version of the deck you can play in Rise of Shadows right now as it tries to establish itself in the new meta. We've also got an overview of the strategy involved, a look at navigating the Mulligan phase correctly, and a breakdown of every combo that exists in the deck. If the deck continues to bound up the tier list we'll keep updating the deck list, and will also expand on all areas of the guide, so that you have the only resource you need for playing it right here! This is the strongest version of Secret Hunter that we're aware of for the current meta. We'll continue updating this over time though, so check back regularly for updates. Secret Hunter is a deck chock full of, er, Secrets, which allow you to keep control over your opponent in the early game. All of these Secrets work to damage and disrupt your opponent’s game plan, either directly through their effects or indirectly by forcing them to make nonoptimal plays in order to play around them. The deck recently got a big bump in power with Subject 9 from the Boomsday expansion. This not only gives you a more consistent way to get to your Secrets, but also provides you with a lot of value by thinning out your deck. Meanwhile, Rastakhan’s Rumble added new hero card Zul'jin. This powerful card repeats all spells you’ve played during the game – including all those Secrets once again! Early game: Use your Secrets to control the early game, choosing which ones to play depending on the type of deck you’re up against. Snipe is a safe choice either way, but you’ll want to prioritise Explosive Trap or Rat Trap against aggro and Freezing Trap if you’re facing control. Ultimately, though, whatever you can do to disrupt their early turns is considered a success. Mid game: Some of your most impactful cards can come down in the mid game. Subject 9 can draw up to five different Secrets from your deck, and considering how many you run here this is bound to get some good value. You also have many very strong removal tools for this stage of the game. Anything your opponent drops can be swiftly batted away by Marked Shot, Wing Blast and Baited Arrow. Try to do what you can to trigger the Overkill effect on the latter for the tempo advantage. Late game: With such a strong mid game you may have already won by this point. Just continue pushing through damage with whichever cards from above you haven’t played yet. Vereesa Windrunner is an interesting new legendary that equips you with Thori'dal, the Stars' Fury when played. This weapon’s damage – and bonus Spell Damage it provides – can be a big boost to your burst finishers like Kill Command. If that doesn’t work you can force your opponent to deal with all of your Secrets again by playing Zul'jin, which gives the deck even more late game reach. It’ll also replay any copies of cards like Unleash the Beast or Animal Companion, giving you a significant board for your opponent to try and deal with once again. 1. Secrets such as Explosive Trap and Rat Trap are perfect for slowing down their early aggression. 2. If they’re sneaking out into the lead just wait for the right time to play Unleash the Hounds and you can wipe out a wide board fairly quickly. 3. Kill Command is best saved for burst damage to finish them off, although it can be used to clear minions in a pinch. 4. Wing Blast is the better minion removal tool though, especially if you’ve manage to discount its cost to one and set yourself up for a big tempo play. 5 If the match is going even later, Unleash the Beast is another perfect catch up card as the Rush mechanic will allow you to trade away one of your opponent’s minions immediately. 1. As with aggro, disrupt their early turns with Secrets. Freezing Trap is particularly good at forcing a single powerful minion back into their hand, while Snipe can kill or take a chunk of health off bigger creatures. 2. The deck runs two copies of Hunter's Mark which are perfect from bringing some of the control deck’s biggest threats down to size. 3. Try to save Kill Command for some surprise burst damage, as if you just use it freely there’s a good chance they’ll be able to heal or Armor up to negate the effect. 4. There’s a greater chance you’ll need Zul'jin to finish out the game against control, so prepare a big pool of spells ready to be recast as well. 1. Animal Companion: Gets you onto the board with a decent minion two times out of three and an OK one every one time. 2. Snipe: Kills most other minions around this level and can put the momentum of the match in your favour. 3. Rat Trap: A better hold against aggro as they’re likely to play this many cards in one turn so early. 4. Subject 9: As it’s such a powerful card in the deck keeping this midgame drop isn’t too silly, plus it’ll fill your hand with Secrets to play. If you want to learn the ways of Secret Hunter then you’ll want to be well aware of these important combos and synergies in the deck. - Hunter's Mark reduces the Health of a target to one, which is easily dealt with by a quick Rapid Fire spell, for example. - Think about when your opponent might be at a point where they can play three cards in a turn to activate Rat Trap. Aggro decks will be able to do this much earlier, whereas that’s less likely against Control. - Any time a friendly Beast dies, however small the victim, your Scavenging Hyena will gain +2 / +1 stats. That makes it a wonderful pairing with Unleash the Hounds. - Try to use Wing Blast after another minion has died on the same turn. Having its cost reduced to one is a huge bonus that also give you room for a strong tempo play on the same turn. - If you've any Beasts on the board, then your Kill Command damage value increases from three points to five. - In order to trigger the Overkill effect on Baited Arrow, the minion you target the spell with needs to have two or fewer Health. - Subject 9 is great for pulling any remaining spells out of your deck and putting them into your hand. This then allows you to keep your Secret train rolling on. - Zul'jin will recast every spell you’ve played throughout the game when he enters the battlefield, so make sure you have enough space for all the Secrets and minions that will hit the board. Explosive Trap: Perfect for dealing with early game aggression: your opponent will be forced to find a way around it, or sacrifice the small minions they already have on board. Freezing Trap: Some more early game delay. If this triggers on the right minion you can seriously disrupt an opponent’s game plan. Rat Trap: More effective against aggro decks that are more likely to be able to afford playing three cards in a single turn. Snipe: Can usually kill off an early drop without issue though some players will be clever enough to avoid it. Marked Shot: Four mana for four damage is about as baseline as you can get, but the extra spell it generates can also be hugely valuable and it pairs well with Zul'jin. Subject 9: Another card that synergises so well with all the Secrets in the deck. You should get a lot of value from the draw effect, but watch your hand size when you play it. Unleash the Beast: A good spell that you’ll want to see activated again with Zul'jin. Vereesa Windrunner: Hard to call this a vital part of the deck, especially in terms of raw stats, but the weapon she provides does bring a substantial Spell Damage bonus that can help you see off a game. Perhaps you can consider a Savannah Highmane in her place if needed. Zul'jin: The new Rastakhan legendary hero card fits elegantly into Secret Hunter as a way to replay all of the Secrets and other spells you’ve cast throughout a match, for a slightly crazy but hugely valuable turn ten play. I've taken out the two Bloodscalps and added The Marsh Queen (hunter quest) and Halazzi. Mulligan the quest (and Halazzi if necessary) into the deck and then save them once drawb. If you're approaching fatigue, empty your hand, drop the quest and and follow with Halazzi. You have 7 1-cost minions and can play them off, follow up with Carnassa and boom, 15 more cards in your deck (and an 8/8 on the board). Gives awesome late game value. Hi guys, this deck list is now fully updated for the Frozen Throne launch. All comments above this one related to an early version of the deck. @Redhawk511 Whoops you are correct, editing in now. In the deck list, you list Explosive Shot (a 5 cost card) in the second position when I believe you intended to include the 2 cost Explosive Trap. @assassin977 Squire! Sorry about that it's fixed now. @assassin977 Do you mean Horserider? To be honest, this deck looks more and more like a concede hunter deck. Unless you draw you essential parts - especially against aggro - you have a lot of dead turns. The drawing part goes for a lot of decks, but especially in this, if you don't have bow, the secrets you need (explosive against aggro) or any Huntresses, you're pretty much dead by turn 6-8. That's my experience at least. Maybe I've drawn like an idiot, but I don't feel like my win is slipping by this easily in other decks. That being said, if you draw like a god, you will win pretty easily, but again, that goes for all decks. @Bedders haha nah, semantics. This whole article was great. In terms of current meta? This build is definately new. @Bedders@Allendroth Thanks for your messages. What I don't like about the recent CoW nerf is that you can't play almost anything in addition of CoW because the 9 mana cost (I mean no traps, no quick shot, etc, even no hero power). So Tracking could become an essential card in hunter decks to choose your next turn card after CoW. @Lokojet Oh and in terms of the nerfs I've just seen these and will cover on the site now. I won't rush to make any changes to the guides though, and will instead let better players than me work this one out first! @Lokojet I think Tracking you look for what you need to make your hand work. If it's a straight Turn 1 play though I would take Cloaked Huntress over just about anything else, but I think there are too many variables to go much deeper than that. @Allendroth Poor choice of words on my part I think. I tend to refer to things in terms of the generally accepted state of the current metagame. I know it's been growing in popularity in deck rankings for a few weeks now, so I suppose I mean it's a relatively new thing to be aware of/play competitively. Thanks for outlining some alternative deck choices too! Theres no way to say this without sounding snoody BUT "Secret" hunter is not new. Far from it. The Trap Hunter archetype has been staring the meta game in the face since blackrock. I have been getting rank 4 or better with minimal effort for well over a year. Players look at hunter as a damage every turn kind of class but it is in fact an incredible control class. The hero power is so effective in this build because even on turns spent setting up control you can deal two damage. This build listed above however is a bit generic in its approach. The Secretkeeper and the Cloaked Huntress are not needed. (I know, sounds crazy right???) and Snipe isnt reliable even if you know the meta. Barnes works great with the Highmanes but to get the most value from him you need to have ONLY the best, NON-battlecry drops in the deck to pull like Ragnaros and Shaarj, Rage Unbound. So I would drop The Curator; why chance pulling a 1/1 taunt with Barnes? Hat Trick works fine as a tech card if Freeze Mage is clogging the ladder but overall its not a great trap for control. Unleash the hounds is a must here and consider snake trap as an early game set up for Misha. More often than not, youll have Loekk to thank for some serious snake and hound damage. Lastly, the Azure Drake doesnt play well here either. The 5 mana slot is heavy, you need those turns for selective removal spells. Drop the Tracking and put in an Explosive Shot for board clear. Trust that Call of the Wild, Ragnaros and Highmanes are enough to finish your opponent. But thank you for covering this topic! Im obviously far too passionate about it LOL! Im gonna go get a life now. What would you suggest for Tracking? I mean priority order? In addition, is the best decision play Tracking in first turns? One more, with the recent nerf, still 2 x Call of the Wild?